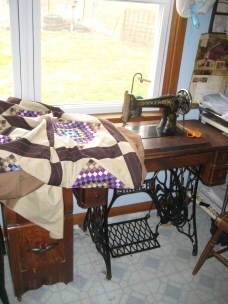 How do I get a custom Amish quilt made is a question that has been posed to the Amish Quilter. The simplest answer to that question is you can call the Amish Quilter, email us, or write a physical letter and send it through snail mail. The contact information to contact the Amish Quilters is listed below at the bottom of this page. Once we receive your info, we will handle your custom order in a prompt and friendly manner. When you contact us, we respectfully ask you know the size of the Amish quilt or quilts you will need. We can make a quilt for any standard size bed, as well as any custom size you are in need of. Other information we will need to know before your custom made Amish quilt can be created is to know the exact pattern you wish to have. Remember, this is your custom made Amish quilt that will be created the way you want. This allows for many different options. 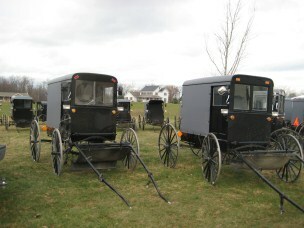 You can have one of the many traditional Amish patterns, along with the traditional Amish dark colors to be used. If you prefer to have lighter colors like yellow, oranges, and greens, it can be done upon request. 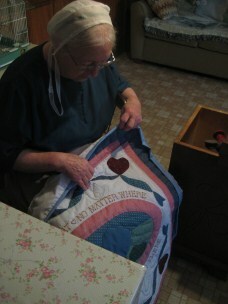 Another very popular option is the making of a custom Amish patchwork quilt. This will require you to supply pieces of fabrics that were worn by you and loved ones. They will be incorporated into the Amish quilt being made especially for you. This allows for fond memories of your kids’ upbringing to be brought back to life when they see a piece of their favorite clothes from their youth in a custom made quilt. There is still another option for those that loved to take pictures. A custom Amish memory quilt can be made from your favorite pictures. These pictures can be of the children growing up, the pets that were in your children’s lives, or even places they lived or visited. The selection of just which pictures that is to be included is yours to make. We can transfer your design or any size picture to the cloth. These designs or pictures can be colored or black and white. The number of pictures is limited to a maximum of 45 for a k ing size quilt. The smallest number of pictures that can be placed on a memory quilt is one. The exact number again is your decision. If you need help deciding on any of these options, please feel free to call us at the below contact info and consult with Patty who will work with one of our Amish quilters. They are experts in this field of Amish art and are more than willing to help you decide on just what will make you happy.